From the minute we decided to make the trip to Nashville, I started reading about air travel with an infant. I wanted to be as prepared and knowledgeable as possible because with babies…you just never know! First time parents much? Did my weeks of prepping and planning pay off? Yes and no. We didn’t travel light, that’s for sure. If I had to pick a few must haves, I’d say a car seat caddy is a must (both for the airport and your destination), as is a car seat cover (we own this car seat). We gate checked everything with no issues. I also took both the diaper bags we own. One carried my pump and milk while the other was filled with Kaiden’s stuff. We decided to fly Southwest for several reasons. Great cancellation policy. Get to board after group A. Free checked bags. Need I say more? In fact, we enjoyed our experience so much that I decided to fly with them over the holidays. Fingers crossed all goes well again! Regardless of the airline you select, don’t forget to bring your baby’s birth certificate with you. You’ll need to obtain his/her boarding document. Both Vishnu and I have TSA precheck, so getting through security was fairly easy. I carried K with me while Vishnu loaded up all our stuff (bags, car seat, caddy, etc.). We made sure to let the agent know that one of the bags contained my pump + breast milk. He advised us to take out the breast milk out of the bag and place it on the belt as a standalone item. Another agent tested my milk by putting each bottle in a machine of some sort. It took a bit of time but was relatively simple. On our way to Nashville, Vishnu and I grabbed a middle and aisle seat totally thinking we’d get the row to ourselves. No one would want to sit next to a couple with a baby, right? Well, the plane was 100% full, so…WRONG! Honestly, with an infant, your strategy doesn’t really matter. Most flights are full these days, so the likelihood of getting a row to yourself is close to zero. Our 4.5 month old infant did much better than anticipated. In fact, on the flight to Nashville, Kaiden bounced and played a little before passing out. On the way home, he was a bit more antsy and probably a little overtired. But we didn’t experience any major crying fits or anything like that. A lot of people told us to feed him upon take off and landing to help prevent his ears from popping too much. Great advice. He drank some milk on the flight over but wanted no part in anything of the sort on the flight back. So we resorted to giving him his pacifier, which thankfully did the trick. Other than that, I made sure to have his teething ‘toys’ in one place (big zip lock bag) in case we needed them. So helpful! Vishnu and I were definitely ‘those’ first time parents travelling with a baby. We over packed our suitcases and even our diaper bags. And both of us were super nervous about Kaiden potentially crying nonstop (so thankful that didn’t happen!). While we were ‘those’ parents, I think we did ok! Next time, we’ll probably be a little more judicious with what we pack, and we probably won’t get to the airport so early (we sat the gate for almost 2 hours). Not too bad for first timers. Story #1 – The lady who sat next to me on the flight over seemed nice enough. She engaged with Kaiden and told me all about her teenager kids. She even went as far as saying she often wished for the days when they were babies. But then she made a comment that threw us off a bit. It was 100% harmless, and I probably read into it way too much. In fact, I know I am because I’m writing about it right now. Ha! Anyways, she looked at Kaiden, and in a baby voice said, “Don’t cry now, baby, because then no one on the plane will like you.” Umm…ok. Who says that to a baby?! Someone who’s a mom of three at that! For the record, not only did Kaiden not cry, but he was an angel. And what if he did? HE’S A BABY! Story #2 – As soon as our flight home took off, Kaiden let our some gas. Not normally a huge deal. I handed him over to Vishnu so I could find his toys. After a few minutes, Vishnu said, “Par, he smells pretty bad. I think he needs a diaper change.” My immediate thought? NOOOOO! My one hope was that we wouldn’t have to step inside a tiny airplane bathroom with K.
Well, we survived! I thank my lucky stars I talked to my friend Purvi the Thursday before we left. She told me all about their first flight experiences, which included a diaper change. The conversation gave me a boost of confidence (a very small boost!) as I changed this very dirty diaper. So no true horror stories, but we definitely got a few good laughs in on this trip! 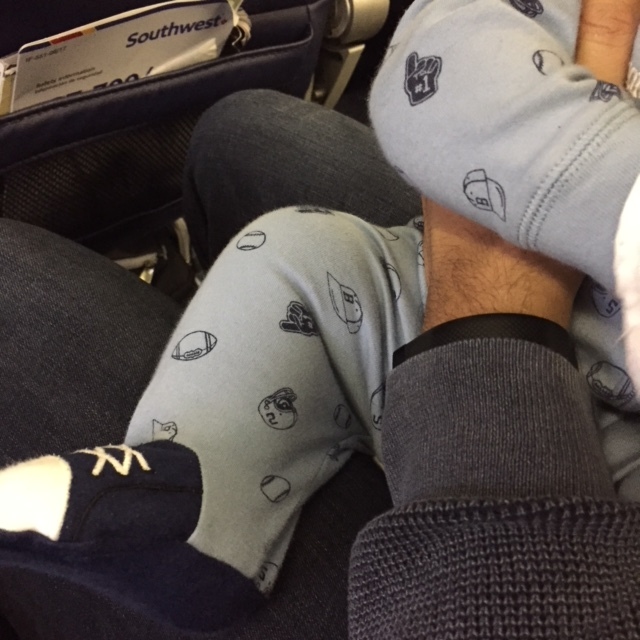 I feel like traveling on a plane is hard enough so I can’t imagine traveling with a baby! Props to you!! Thanks! Quite a different experience but still fun nonetheless! LOL to your story about the lady on the plane. Even though I’m sure it was harmless and she didn’t realize what she was saying, I totally would have reacted the same way, as a sensitive first time mother on a first flight!! We just had our first flight last month so i totally feel you! Exactly…I didn’t let it bother me too much, but it definitely gave me reason to pause! I’m glad it went well, traveling with babies can be good and challenging! And what the h$%^k. Who says that to a baby?!?! Thanks, Salma! And yeah, it def threw me off a bit!